It has been said from time to time that we Canucks are among the world’s best when it comes to political satire, social commentary and documentaries that dare to explore topics deemed too bad-boy for prime time. And I buy that. We can do satire and aren’t afraid to expose what needs exposin‘. Probably has something to do with our tendency to self flagellate / deprecate or whatever…. in any case, we, by and large, don’t take ourselves too seriously. 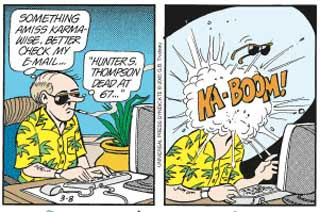 But I just linked a site that I shoulda linked first and foremost: Doonesbury. I have read Trudeau’s strip off and on since I was a teen. He’s an iconoclast a peacenik and a democrat who will one day be remembered in the same breathe as Mark Twain and Voltaire. Guaranteed. He has tackled all of the hot button stuff and has done it admirably and with respect… and with humour. With complete seriousness, I have to say that if I can ever reach a point in my life where I have said and shown a minuscule portion of the satirical talent that Mr. Trudeau has put forth over the decades, I can die a satirically satisfied man.